BLOG : Free (& Real) Marketing Tips. Does my site need to mention Cookies? STARTUPS SITE? ...short-cut to the likely impactful tasks first. E-MAIL SMART ...learn who's opening your e-mails and who's binning without looking. WEB RESEARCH & TESTING ...don't waste valuable resource (time & money) - quickly test your web markets. Business Modelling ...discuss your product offering, from concept to delivery. ... it's nothing to do with your Google Ranking! Rapidly learn of key-phrases and keywords that work. Forecastable growth... x Spend = x Enquiries / Sales. Ability to instantly change keywords you show top of Google for. ... why use a Pay Per Click Consultant? Our input will change your mindset and approach for the better. Receive ideas that you definitely wouldn't expect nor could foresee. Receive an affordable, logical and practical way forward. Yes, our ideas are much more than PPC, we aim to make our proposal a self-funding one. You'll receive advice on 'True Marketing & Business Principles' (not just AdWords). You'll receive idea's focussed on winning 'not just more business'; but 'better business'. You'll get a self-funding pay per click model (speak with us about this). Don't be one of the many wasting £100's or £1000's each month! We show them where they went wrong and it usually amounts to them learning they wasted 80% - 90+% of their Google spend each month. 3. Google's system doesn't make it as easy as you may think (bordering misleading). What makes a good AdWords Consultant (or Adviser)? - They should take time to understand your business goals. - Your AdWords advisor should have an analytical mindset. - Your consultancy should be able to evidence what's working and what's not. 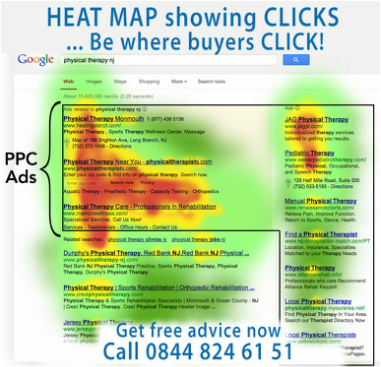 "People don't click Google Ads"
Heat map showing where buyers click. Many INDEPENDENT studies have show over the years where people FACTually click. Companies who track 'Sales Path' spend £1,000's on Ads because they realise it leads to sales. "I'm 1st in Google & don't need Ads"
Google Ads outperform Google Organic by as much as 90% more sales. PROOF VIA A BET: One Client bet us they didn't need the Adverts as they ranked 1st organically. 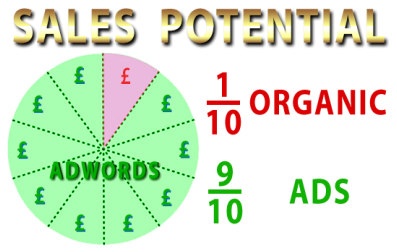 Against our evidence & advice, our Client paused their ads on their least performing day - their resulting sales for that day dropped to £90 instead of the usual £900. "Why 1st position is not best"
Optimise your Google Ad to be 3rd (1st is not best). Stats & studies show 3rd position gets clicked more. 3rd position costs less than 1st position. So, you get more clicks for your money, but more importantly: You get more 'buyers'. We ensure all your Google Ads average the optimal 3rd position! ... from £59.00 - minimum Analysis & Report service. We'll call you to understand (brief fact find). We'll present a report with weaknesses & opportunities. ... all the above +1hr onsite holistic analysis. ... * £75 total (if near Swansea). Prefer us to 'review onsite' instead of 'offsite report' ? ... get insight to our review methods upto 2hrs. ... * £85 total (if near Swansea). *If outisde of Swansea add 40p per mile. You've heard 'There's no quick fix in life' - well, you'll learn any Google Campaign is no different; especially AdWords ! TIP: Seek a supplier wanting a 3 month relationship as a minimum - as it'll take roughly that in order for anyone (or us) to properly understand your business and test various direction - Longer if you want a great Campaign (whether you use us or someone else). MONTH1 : Understand and Identify Business Goals > Research > Draft > test via multiple Short Burst Live Ad Tests. MONTH2 : Review 'Stats' > Improve > Longer Burst Ad Tests. MONTH3 : Full Month Ad Test > Review 'Sales' > Shape. NOTE: Larger Ad spends 'MAY' require more 'Consultancy Time' and therefore higher fees. Either way, we'll discuss with you first of course! You've heard: to get 'anything' done quickly and properly in life, takes time or money - Often, you best opt for concentration and expertise in order to limit that Time or Money - Naturally, we advocate such. We often explain: whilst it's 'possible' we could try to do what you do for a living (gulp), it's highly likely we'd not do it as well as you would - and vice versa. So... CORRECT MINDSET + CORRECT EXPERIENCE = EFFICIENCY. ... we apply our highly analytical mindset in an efficient manner and get done in an hour what would likely take you days if not months to get right (depending on your experience of course). Most 'Modern Marketing' (PPC, Facebook etc) relies on 'Permission Marketing' whereby you are being put in front of those who are in your market to buy. Nearly all 'Traditional Marketing' (press etc) relies upon 'Interruption Marketing'. E.G. In hope of a well constructed Ad interrupting the reader's track of thought and selling to them. As far as AdWords goes, you may know & appreciate that your Ad will only show (should only show) to those who are searching for keywords relating to your product or service. BUT! ... consider getting your ad in front of those who are not searching for your product or service, but will still like your product? This means, you need to write your ad in a way which not only 'interrupts' their track of thought but sells them a new idea. ... Someone Google's "Exhibition Stand Builder", you won't see any ads appearing for "Exhibition Stand Hire" and yet, this is a lucrative job if sold. and likewise our AdWords Support & Tuition packages are of exceptional value. Even opt to request a Custom AdWords Guide or Custom Support from an AdWords Consultant.